Scores of women have invaded Ubud, Bali, looking to emulate Gilbert's enlightenment. Their expressions are serene; their caftans, expensive. But their beatific dollars aren't necessarily a good thing. I recently went to a party in Ubud hosted by a French woman living alone in a massive single bedroom house. The guests arrive in flowing white clothing - this was the dress code indicated on the invites - and they are overwhelmingly female. A 40-something woman wearing a gauzy dress leans over to me conspiratorially. "I'm writing a book," she stage whispers, looking around as though to make sure nobody steals the idea, "about how difficult it is to be a middle-aged woman." She's not the only one. Almost every woman I've met in Ubud says she is writing a book. The topics vary, but most involve the same kind of navel-gazing female middle-aged protagonist. You see these aspiring authors sitting at laptop computers set in palm-fringed verandas smelling of incense as they delve deep into themselves and try to find a bestseller. According to the locals who met her, Gilbert was a rather quiet woman, not abnormal or larger than life. It's something to consider when almost every conversation in Ubud will somehow return to The Book, which is prominently displayed around town, framed and in multiple languages. Expats (many of whom are ponytailed men who once lived in Northern California) mostly hate it. 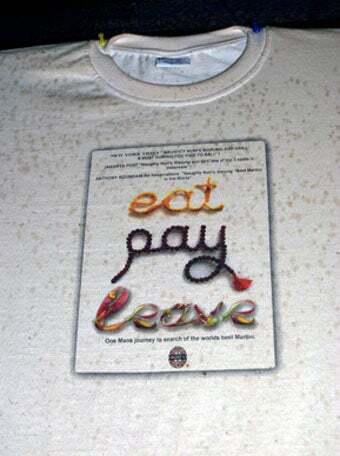 One restaurant has a t-shirt for sale, the design of which urges people to Eat, Pay, Leave. They're sure that the influx of 30- and 40-something women wearing caftans will ruin the area, making the place they like to party into one big estrogen-fueled, self-actualizing yoga retreat. A bookstore in Ubud reminds passerby of the town's claim to fame, as if anyone could forget. With its Pilates classes and plentiful shops selling overpriced flowing clothing, Ubud has catered to women seeking spiritual harmony since long before Gilbert, but the book was a tipping point for the temple-strewn town. Gilbert's haunts here have become destinations of their own, stop-offs on an Eat, Pray, Love pilgrimage. Many of these places now have waitlists and, in some cases, have begun charging exorbitant prices. The prices are paid with due reverence by Gilbert's devotees, women wearing stylish resort wear and similar Buddha-like smiles. Locals who gained fame from Eat, Pray, Love have turned into almost caricatures of themselves, having decided that if they are going to have to live up to their persona on the page, they'd better be profiting. Two filmmakers I met from California tried to interview Ketut Liyer, one of Gilbert's traditional Balinese healers in the book. Instead they were handed a copy of the book and directed to read aloud certain passages while Liyer listened. Ubud's strange post-Gilbert scene is about to get even more odd, seeing as there are now ostensibly two Gilberts: the author herself, and the author as depicted by Julia Roberts. Roberts stayed in Ubud during the filming, but the film's locations and real-life counterparts don't all match up. This may very well double or triple the must-see sites on a tourist's itinerary. You can go to the restaurant Gilbert ate at in the book, the restaurant "Gilbert" ate at in the movie and the restaurant Roberts herself ate at when she wasn't filming. I fear that once the movie opens, this whole area will turn into a far-flung Magnolia Bakery line, with women typing frantically on their blackberries and snapping photos of menus and street signs as their bored boyfriends gaze off into the middle distance. There are inherent problems in trying to emulate one woman's quest of self-discovery, and inevitable disappointments - the largest of which is that you will never learn that you are, in fact, Elizabeth Gilbert. Her experiences were what they were because she carved her own path not one already written for her. And I can tell you with certainty that there aren't enough Javier Bardems here to go around.